Many people store green tea at room temperature in a kitchen cabinet, but is it keeping your tea fresh? If you are to get the maximum health benefit, you ought to know a few things to keep your tea fresh. First, we need to know what fresh tea is and how tea is affected in an ambient condition. Generally fresh green tea smells very green, refreshing. It shouldn’t smell smoky, stale or moldy. If tea lacks freshness, it is likely you are getting little health benefit from your green tea. Some types of green teas are more affected than others. Teas with small leaf particle size such as Deep steamed sencha and matcha deteriorate quicker than large leaf teas due to greater surface area. Correct storage can significantly prolong the freshness of the tea leaves. When tea comes in conact with oxygen, it is readily oxidized. Generally vitamin C that is present in green tea is oxidized before catechins which are known antioxidants in green tea, but when Vitamin C in the tea gets depleted and oxygen looks for another target, start to oxidize catechins and makes catechins less effective as antioxidants. The color of tea leaf becomes visibly affected and the smell of the leaves lose freshness and start to smell old. Also, tea is affected greatly by moisture. Tea is generally dried to the point that it stays relatively fresh for longer period of time on the shelf, but when leaf moisture level increases, it speeds up deterioration process rather quickly. To retain freshness, tea should be stored in a refrigerator in a sealed airtight container that completely blocks light and that you can remove as much air as possible. In my experience, our resealable bags are generally better at keeping air out than tin can because you can squeeze out air more effectively in a bag than a tin can. I usually have two separate tea containers. One is either an air tight tin can or a thick resealable storage bag on my tea cabinet shelf. This is stored at a room temperature and it is my daily tea container. The other big master container is stored in a refrigerator. As the daily container empties, I restock from the big master bag. This way I minimize the deterioration of the main supply of tea while small quantity of tea is readily accessible anytime. When you remove your tea from refrigerator to replenish your shelf supply, make sure to let the bag of tea to come back to room temperature before you open it. Temperature difference between the tea leaf and air creates condensation on cold tea leaves and spoil the leaf. At least wait for 1/2 day before you open the bag. Also, pay special attention to how tea shops you buy from store their teas. Some tea shops store teas as a bulk in an large container on a shelf. It looks nice and makes it look good display, but if the container is opened and closed frequently and does not empty qucikly enough, much of the tea gets exposed to air and get oxidized and lose effectiveness. Try and find a tea shop that stores tea in a sealed airtight container or sell prepackaged teas directly from factory or package in vacuum package or use a few oxygen remover. There are certain green teas that does not require refrigeration to stay fresh. Certain harvest types and processing styles are known for better shelf life at room temperature. I have been experimenting to find which harvest and processing actually improves and retain freshness at room temperature. Also, some of these teas have tendency to age better than others. Much like great puer teas and some oolong teas are known for aging and post-fermentation which actually improves the flavor of tea rather than deteriorate. Natural farming rot test shows how vegetables grown with chemical fertilizers tend to rot quicker than organic fertilizers and no fertilizer. Generally more natural the growing condition is, it tends to store well and preserve freshness. We looked at the two containers of our premium green tea at tea tasting. One was stored in a refrigerator, sealed. The other was stored in a tin can about 1/2 full at room temperature. 1/2 year later, the difference was clear in dry leaf color (green vs. brown). Also, the old tea lost fresh green smell and taste while the other one retained fresh green taste and smell. Tea leaves are extremely sensitive to moisture level. They are generally dried to the point that it’s relatively stable for extended period of time. Under ideal moisture condition, generally tea leaves are coated with single layer of water molecules which prevents oxygen contact to the tea leaves. Tea leaves readily absorb moisture under unfavorable storage condition such as frequently opened bulk container or container with much air space. When moisture level becomes higher, typically due to increased leaf moisture from air, excess water acts as a catalyst to speed up the deterioration process. Also, when the leaves become too dry, the surface water molecule layer is disturbed and it makes prone to further deterioration. Excess moisture makes various chemical components in tea like chlorophyll and vitamin C vulnerable to deterioration. Chlorophyll gets oxidized easily. 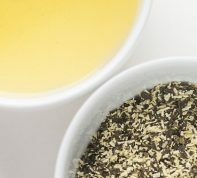 For this reason, green tea loses greenness and become more brown color over time. 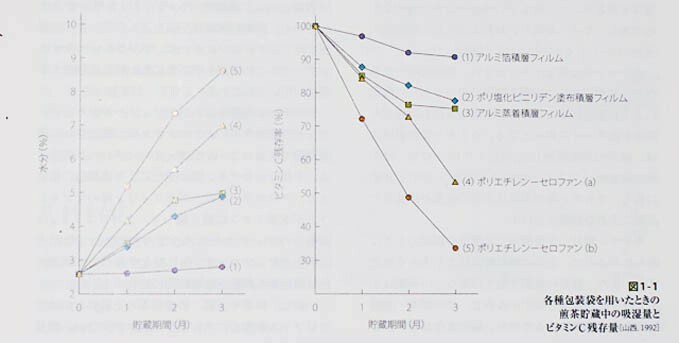 LEFT: This graph shows that how tea in each 5 packaging option (1- aluminum foil film, 2-pvc film, 3-aluminum coating film, 4-Polyethylene-cellophane a, 5-Polyethylene-cellophane b) changed in leaf moisture level (Y) over 3 months period (X). RIGHT: Also the same samples are tested for vitamin C content (Y) over the same time period (X). It is fascinating to see that moisture increase in tea leaves (left) corresponds to vitamin C loss (right). This test used various types of packaging materials. Although all the package materials seem to seal air tight, moisture and oxygen permeability vary. Vitamin C is typically used as a good indicator for other chemical levels as well since vitamin C is very reactive and easily oxidized. What’s the best way to keep the leaf dry? My grandmother had 2 containers she kept her teas. One was green tea for guests and the other was green tea for daily consumption. Guest green tea was stored in a small tin can about 1oz at a time and frequently refilled. This way she was certain that the tea served to the special guests were always freshest possible. and the master bag was exposed to air minimally. Her daily tea was stored in a large can that was easy to use and stored 2-4 oz of tea at a time. and she consumed the tea in 1-2 weeks so that was still kept fresh. Make sure to use up what’s in a tin can in 1-2 weeks for freshest result. During the storage, the tea leaves should be stored in a high barrier container that does not allow moisture to penetrate. Typically aluminum foil lined bags and some tins work. Whatever container you use, make sure to leave as little air as you can in the container. Also, minimize exposure to air by limiting opening frequency of the container. Typically when people buy tea at a store or tea shop, they like to see what kind of tea is inside. Being able to actually see the leaf give them extra feeling of security. Also, leaf shape and color can tell us much information about tea quality so we should be able to tell its quality by looking at the dry leaf through a clear plastic window. But is this a customer friendly packaging option? Both natural and artificial source of light can have deteriorating effect on tea. UV light has greater impact than visible light, but even fluorescent light under typical household or shop condition is known to change the quality of tea dramatically. Tea stored in a sealed clear plastic bag and placed under direct sun does not show immediate sign of change in leaf color, but soon the flavor changes. When tea is placed in a sealed clear plastic bag and stored under white fluorescent light over 30 days, the leaf color changes from green to reddish brown, loses surface gloss and fresh taste. What’s happening when tea is exposed to light? Most importantly chlorophyll which gives green color to tea leaves react to energy from the light. Chlorophyll is excited by light and becomes more reactive and start a chain of chemical reaction. First, excited chlorophylls react with existing lipids to form free radicals, then these free radicals further attack more chlorophylls, carotenoids and catechins (or common green tea antioxidants). 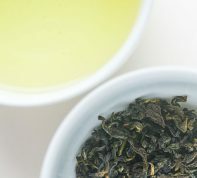 Chlorophylls are an important element that gives green color to green tea and about 1% of chlorophylls is known to be present in raw leaf harvest. Under shade grown condition chlorophyll concentration can increase up to 2%. Chlorophylls in oxidized tea like oolong and black tea also get oxidized to Pheophytin and lose Magnesium ion (Mg2+) . 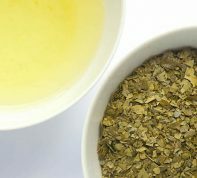 Also, catechins, or effective antioxidants in green tea, get oxidized and change the leaf color to yellowish green, olive color. Chlorophyll is an extremely unstable component that can be readily affected by moisture, pH, light and chlorophyll itself also becomes light sensitive and promote deterioration in finished tea. For this reason it is important to keep chlorophyll from being reactive in storage condition. What keeps light from deteriorating tea? Short answer is anything solid that doesn’t allow light to go through. Usually tin can or metal containers are good as long as they do not give off odd smell. While all the other deteriorating elements are taken into account, the most convenient and useful options are high barrier resealable bags. Over years we have found that high barrier aluminum lined bags typically preserves tea the best from light, moisture and oxygen. Traditional storage options did not include plastic bags and refrigerator, but they knew how to protect their tea from basic deteriorating elements. They used solid tin or wooden box lined with foil or even paper and stored in a cool dark place. Oxygen is found everywhere we look at and also sneaks into packages of food items that we store. We often find a little package saying “DO NOT EAT” or oxygen remover to keep oxygen from coming into contact with food, which can cause rapid deterioration. We’ll look at what oxygen does and how it affects green tea quality. Oxygen is one of the major components that cause deterioration in tea. Oxidation of raw harvested leaves can modify tea into oolong and black tea and gives different feel to its flavor and aroma as well as chemical compositions. However, when finished green tea gets oxidized, it results in lower quality especially in tea flavor. Oxygen is known to oxidize ascorbic acid, catechins and lipids that are present in green tea, which significantly affect the quality of tea. Although oxygen alone is not known to cause significant deterioration in finished tea, effect of oxygen is closely related to what temperature and moisture have on tea. Ascorbic acid is commonly used as an indicator to show the quality of green tea. Typically when the remaining concentration of ascorbic acid is more than 80%, there is little deterioration in green tea or you barely notice in your taste testing. However when the ascorbic acid level gets lower, the quality loss in flavor and aroma becomes noticeable. Due to highly reactive nature of ascorbic acid, other components such as catechins and carotenoids are less likely to be oxidized in the presence of ascorbic acid. Once ascorbic acid is all oxidized, catechins and other components are also subject to deterioration. What temperature should you store tea at? To keep it fresh, should our good quality green tea be kept at room temperature, refrigerated, or frozen? Occasionally , we hear that our customers store their tea in a food cabinet with spices and other dried foods. What is the problem with this method? Although dry storage is a common practice throughout America and many other parts of the world, when it comes to freshness and effectiveness of green tea’s antioxidants, there is a better place to keep your tea. In this article we will look at the influence of temperature on freshness. Even under low light and moisture conditions, if storage temperature is higher than 30C, 86F, the green color of the dry leaf starts to fade. Even with the presence of oxygen lower temperature delays oxidation, and thus deterioration. When tea is stored without moisture, light and oxygen, at low temperature, it does not deteriorate readily but can mellow through aging. Although aging of tea does not happen to all green teas and often depends on the growing, processessing and harvest type, (grade), low temperature storage can be significantly better compared to storing at room temperature. In this study, vitamin C is used as the indicator of green tea deterioration because vitamin C is readily oxidized and typically used to show the quality of green tea and antioxidants. Generally, nitrogen gas is used to replace the existing oxygen in a bag since nitrogen has little effect on green tea deterioration. What can you tell from the graphs? Generally tea stored at 5°C as opposed to room temperature has higher residual vitamin C content, and especially when air is present. 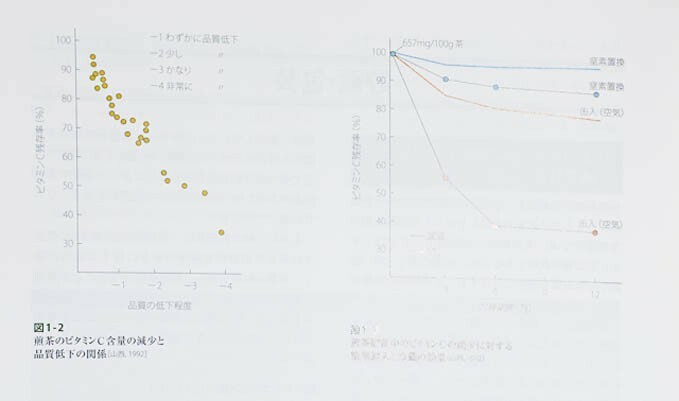 Graph 1-2 (left) shows that when vitamin C content is 70% and above, the x axis is only 1. This indicates that deterioration is minimal and in most cases, it is almost unnoticeable by our senses. Also, in cold storage, If nitrogen gas replacement is used, tea stays fresher. We also conducted simple experiment to compare our Kama’aina green tea stored at different temperature, room temperature (-20C), refrigerator (-5C), freezer (below 0C). We did not use nitrogen gas, or vacuum packaging option to replicate more of what happens at household level. Tea stored in a 1. freezer (left), 2. refrigerator (center), and 3. room temperature (right). The tea was stored for 6 months sealed in a high-barrier bag and taken out of freezer and refrigerator 2 days before testing to ensure that there is no water condensation on dry leaf. The result was not visibly noticeable, but there was clear distinction in smell and taste of the brew between cold storage vs. storage at room temperature. Tea stayed fresh without much noticeable change Tea stayed fresh, but became milder over time through cold storage aging Tea did not lose color on the leaf, but smell and taste were affected significantly. In conclusion, even our simple experiment demonstrated that storage at room temperature temperature aids in deterioration of green tea. Keep your tea in a refrigerator for the best result. Freezer will keep your tea fresh too, but may affect your tea more once it’s opened and moisture level of leaf changes.